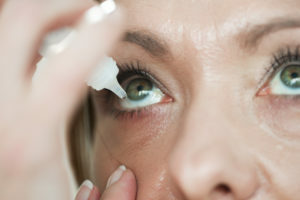 Home » Blog » Women, Here’s What’s up with Those Dry Eyes! Women, Here’s What’s up with Those Dry Eyes! Dry eyes cause excessive watering, itching, burning, and a scratchy sensation. Living with these frustrating symptoms for even a day or two can be unnerving. According to statistics, though, millions of people suffer them on a regular basis. Women, in particular, are prone to chronic dry eyes, or dry eye syndrome. To make matters worse, research indicates that the risk and prevalence of this condition increase as a woman ages. We don’t want to focus on the negative aspects of chronic dry eyes. What we aim to do is increase awareness of the various factors that could create risk. The more you know about your personal risk factors, the better you can manage your eye health. Anyone can be affected by dry eyes, either temporarily or persistently. The onslaught of digital devices has led to a noticeable increase in dry eye conditions. However, women have addition risks that are unique to their biology. Hormones have a direct effect on the eyes. Fluctuations during pregnancy and menopause account for a large number of dry eyes cases. Additionally, taking oral contraceptives or hormone replacement therapy may also increase a woman’s risk for eye irritation. Certain medical conditions and medications besides hormonal contraceptives have also been implicated in an increased risk for dry eye among women. Women who wear contact lenses may be more prone to dry eyes and are encouraged to develop healthy lifestyle habits around contact lens use. Chronic dry eyes get in the way of the things you love to do. This condition doesn’t have to leave you feeling inflamed and frustrated. There are both lifestyle remedies and professional treatment to help you regain comfort and healthy function. Mild cases of dry eye may be managed with lubricated eye drops. Talk with your doctor about advisable use! Anti-inflammatory medication may reduce symptoms related to underlying inflammation. However, this does not “cure” dry eye. LipiFlow treatment relieves the symptoms of the chronic dry eye by restoring function to the Meibomian glands in the eye. Roholt Vision Institute, in N. Canton, Canfield, and Alliance, is one of a few practices in which LipiFlow is available. Contact us to learn more about the chronic dry eye and your treatment options.